KTM is Europe’s second largest motorcycle manufacturer and dominates the off-road segment across the world. 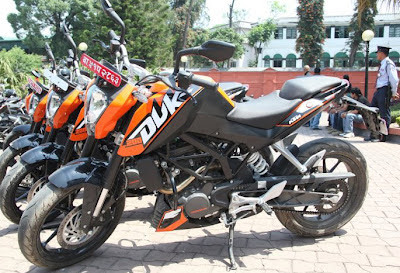 KTM and Bajaj had launched their first bike ‘200 Duke’ in India on 24th January, 2012. Recently this bike is launched in Nepal by Hansraj Hulaschand & Co. Pvt. 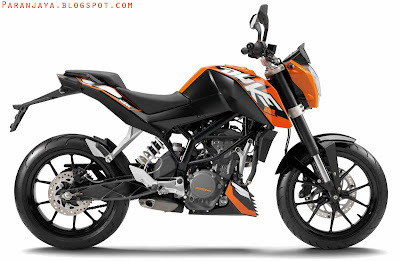 Ltd.
KTM 200 Duke is priced very competitively at Rs. 3,50,000 Only. The new KTM showroom is located at Bhim Plaza, Naxal. At this cost it will be a definitely be a hit since 200 Duke is awesome in terms of looks and styling moreover is also very powerful 200cc bike. 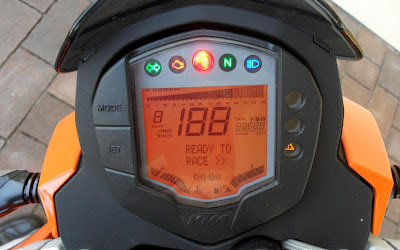 Yamaha R15 is a 150cc bike which is selling very well because it is precisely very sound, same is with KTM 200 Duke which features a liquid cooled 200cc engine which generates maximum power of 25 Bhp and also comes with front and rear disc brakes. This bike is mainly consists of Black/Orange shade and is expected that it will also be available in White+Orange and Black+Green in near future.